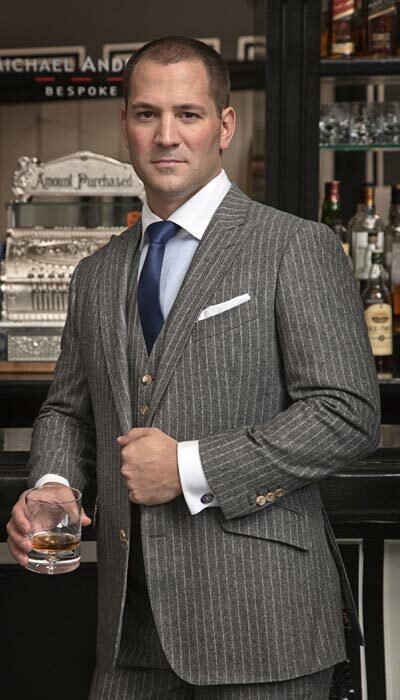 Michael Andrews Bespoke was founded in 2006 by former attorney Michael Andrews in New York City. Success came quickly for the shop as it has been named one of the best in the city by many magazines and publications as well as by the clientele who come to be fitted for one of their suits. Also, what makes Michael Andrews so unique is the in store bar where clients can relax and refresh over a drink during a fitting appointment. Of course he makes great suits too! You gave up being a successful attorney in banking to become a tailor. Why? As an attorney, I was wearing a suit and tie work everyday and could never find anything off-the-rack that fit to my liking. I resorted to having a few suits custom-made and still wasn’t satisfied with the end product. Knowing there were so many other men out there with the same problem, I decided to open my own shop and really be able to help guys look and feel their absolute best. The idea of having a bar at my fingertips certainly didn’t hurt, either. Share your secret on success as a tailor. How did Michael Andrews Bespoke become an establish name in New York City in such a quick time? A huge part of our business is word-of-mouth and the return of existing clients, which is certainly the biggest compliment a business can get. We treat our clients like true friends – we get to know them well, we know their likes and dislikes, their styles and fit preferences, and even their favorite drink at the bar. Those real relationships are part of what keeps our clients returning month after month, and also keeps them raving about MAB to their friends and coworkers. Our own clients have been an enormous part of our quick success in the city. That same unparalleled client service not only helped us grow so quickly, but has also set us apart from our competitors. Everyone has their own specialist for all the important things in life – you have your doctor, you have your dentist, you have your barber – and our clients have their custom tailor. What type of suits do your clients normally request? There’s really no so-called normal request. Part of the beauty of custom suiting is the ability to make it your own. That said, we tend to see a trend in our DC-based clients versus our New York clients. DC men generally prefer solid navy or charcoal suits (no one wants to look too much better than their neighbor on The Hill! ), while our New York clients tend to venture a little more outside the box. Our house aesthetic is a slim and sleek cut, so it’s the actual fit of the garment that’s more universally sought by our clients. Being located in Two Power Centers is the Donald Rumsfeld Power Suit look popular? Surprisingly (or not), no. Most clients are in search of a modern, slim, updated look and fit. I can’t say many people come to us in search of a powersuit but we’ve been known to make some badass double-breasted pinstripe Boardwalk Empire-style suits that would knock the socks off Donald. My impression is you have clients who are in a constant state of being in a fire drill. How do you get them to relax long enough for a fitting? You’re right – some clients really do want to get in and get out as quickly as possible, which is never a problem since we try to accomodate as many clients as we can based on their availablity. But even for those who are always on-the-go, the bar does a good job of slowing down that pace and helping people relax and enjoy their time in the studio. If a person buys one suit from you, which style would you recommend? I’d recommend something with classic details and a versatile color that will allow the client to get the most mileage out of the suit, regardless of occasion. You can never go wrong with a texturized dark navy or charcoal fabric, notch lapel and 2-button jacket – something like that can carry you seamlessly from day to night, business to pleasure, and to any events you might attend along the way. Let your personality shine through in the lining with bright colors and patterns and let the fit of the suit do the rest of the talking. Your favorite place to wear a Michael Andrews Bespoke Suit? Our favorite place to go wearing our best suit is Daniel on 60th East and 65th.